2018 Tech Index – Is The Era Of The Technology “Wild West” Over? DLA Piper today launches its fourth Tech Index study into the perceptions and attitudes of European technology growth. The report reviews how attitudes are changing regarding market developments, shifts in the financial regulatory landscape, and government policies designed to spur business innovation in an increasingly uncertain and disruptive world. Harnessing big data is becoming standard practice for IT and marketing teams in technology, but DLA Piper‘s 2018 Tech Index reveals that a revolution may now be underway in finance and sales departments as well. Responses from 350 tech sector senior executives in Europe indicate that compared to 2016, organizations are increasingly identifying new opportunities in these additional departments, indicating a move towards widespread adoption of big data in the tech sector. Finance (4%) and sales (1%) ranked the lowest among departments which could utilize the benefits of big data in the 2016 survey. The latest results show a significant shift in approach, however, with each department rising to 22% and 21% respectively. While the benefit of big data is clearly prevalent in other departments, like IT (70%), marketing (55%) and customer services (23%), conditions for commercialisation and productive use of big data appears to be spreading across tech businesses. The survey also found that challenges for big data in the tech sector are decreasing. This could indicate the emergence of a critical mass of skills and conditions for widespread use. Concern over the most widely reported challenge, protecting data, is down to 58% in 2018 from 62% in 2016, while skills or resources to analyse data or take on big data initiatives is down to 46% from 56%, and collection and mining of data is down to 41% from 52%. Cloud computing also appears to have reached a level of maturity, with 92% of respondents stating they have a cloud strategy in place in 2018, which provides the ideal platform to deploy big data techniques across departments. Combined with falling concerns around data privacy (47% in 2018, compared to 55% in 2016), the findings suggests a growing confidence in the cloud, even during a period of prominent challenges around GDPR. For tech businesses trying to harness big data across different departments, the ability to utilize and deploy cloud computing, cyber security and artificial intelligence (AI) technologies is critical. Responses to questions in the 2018 Tech Index across these fields show an increasing readiness for this to happen. The growing maturity of the tech sector is also reflected in respondents’ confidence in their cyber security measures with 73% stating that they feel “fairly secure” against attack. However, businesses are not resting on their laurels and when asked about how concerned they were about cyber breaches 44% of companies rated their worry as 8, 9 or 10. Acceptance of AI is also on the rise. The Tech Index suggests that as AI increases its reach across businesses in all industry sectors, the initial fear factor that inhibited its growth seems to be diminishing. Down from 47% in 2016 to just over a third in 2018, fewer respondents see acceptance of AI / robotics in the market due to potential job losses as a key drawback. A bigger obstacle for businesses looking to utilize AI across departments may be the cost of investment, these concerns persist even if they have fallen from 50% in 2016 to 46% in 2018. This is DLA Piper’s fourth Tech Index study into the perceptions and attitudes of European technology growth. As ever, we review how attitudes are changing with regard to market developments, shifts in the financial regulatory landscape and government policies designed to spur business innovation in an increasingly uncertain and disruptive world. Despite the dynamic nature inherent in the technology sector, the fact that our 2018 Tech Index score is actually unchanged from 2016 (Fig 1.) suggests that we have entered an interesting new era. Previously emergent technologies in areas such as digital transformation, cloud computing and mobile computing are now more widely adopted than ever before and – notwithstanding some notable implementation failures – have undoubtedly reached a new level of market penetration and maturity. Interestingly, however, the means through which these concepts are achieved continues to develop rapidly, surfacing new challenges and opportunities in a fast and fluid tech landscape. While superficially the individual scores that underpin the overall Index have moved very little between the 2016 and 2018 surveys (Fig 2. ), there is plenty of information in the underlying data that points us to some more specific trends. Cloud computing adoption has reached a mature stage, and while some of the barriers to adoption persist, for most businesses these are now outweighed by the advantages. Issues with talent scarcity have never gone away, with the dynamism of emerging tech such as blockchain resulting in acute shortages of people with the desired talent in the newest technologies. Attitudes towards cybersecurity – like cloud – are maturing, with most businesses unsurprisingly aware of the threats, and with processes in place to mitigate associated risks; this doesn’t mean they are complacent, just better protected. For many businesses, digital transformation seems to be a journey rather than a destination, as emerging technologies disrupt already digitized processes, creating budget pressures not foreseen when digital transformation projects were initiated. FinTech has clear strong potential for growth, though one of the barriers to more widespread adoption is the need for regulatory compliance at a time where the rate of development in some of the technologies has outstripped the regulatory framework meant to govern it. The adoption of big data as a business resource is now spreading across the enterprise to finance and sales teams. Cloud computing is now widespread – the new norm – with just 8 percent of respondents claiming that their business does not have a cloud strategy in 2018, against 14 percent in 2016 (Fig 3.). 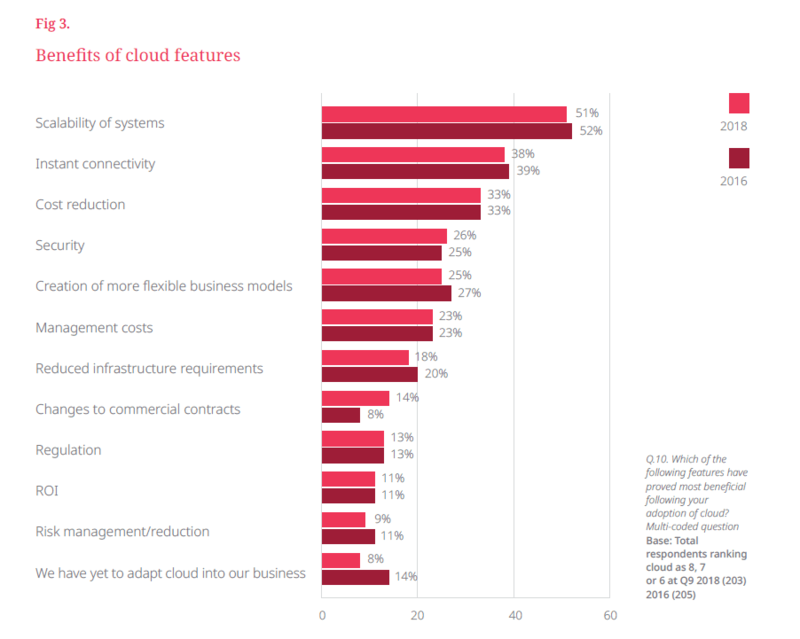 Widespread familiarity with the benefits of cloud is borne out by the fact that there was increased visibility of all eight cloud computing benefits presented to respondents in 2018, compared to two years earlier. However, cloud’s widespread adoption also means that its future transformational potential is seen as more limited than other more recent technological developments such as the internet of things (IoT). Cost was a key cloud computing adoption barrier in the public sector, where it was cited as the most significant drawback (62 percent of respondents). Although overall worries about cost have reduced from 48 percent in 2016 to 43 percent in 2018, perhaps reflecting a subtle move away from government austerity (Fig 4.). The system scalability that cloud computing can bring remains the most widely-recognized key benefit (particularly in the public sector, where 81 percent thought scalability is key), and there is also greater confidence about the security/privacy challenges that cloud computing presents, with this concern tending to decrease even further in the larger companies surveyed. Interestingly, in a period where GDPR challenges have been prominent in the industry, one might have expected security and data privacy to have risen in prominence as a key drawback of cloud computing. However, this showed the largest fall, from 55 percent citing data security/privacy as a drawback in 2016 (and 62 percent in the 2012 survey) down to 47 percent in 2018. This clearly reflects a maturity of outlook on cloud computing across all businesses. This may well be because in an era of tighter regulation, businesses are increasingly seeing that aggregating all their data in the cloud makes visibility and control of that data much more efficient – as opposed to hosting data on premises in a network of unconnected servers. As existing technologies mature, new technologies appear (e.g. blockchain) and the scarcity of people with the required skills and experience to exploit the technology can become acute. 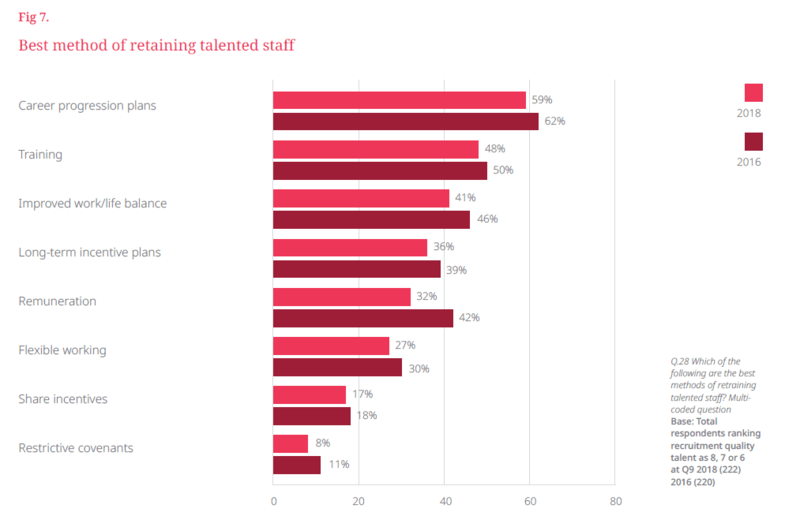 So, while the underlying technologies change over time, the challenge of attracting and retaining staff with the requisite skills features more than ever in our Index. For example, a lack of staff expertise/availability in robotics remains the key barrier to the adoption of AI across all businesses (52 percent of respondents). 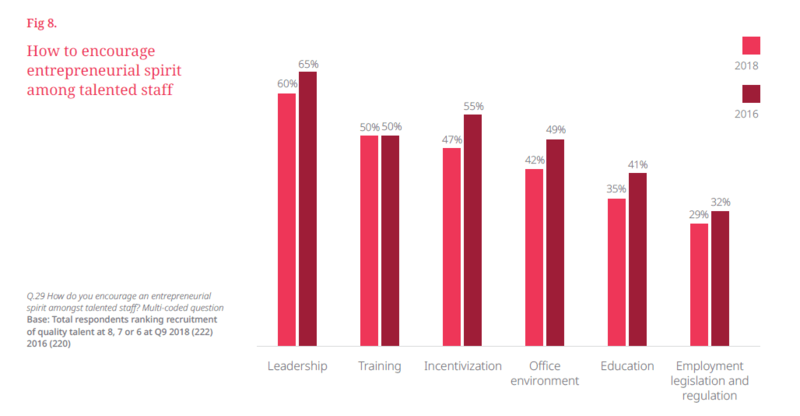 Each of the six factors presented as having an impact on recruitment was given a higher score in 2018 versus 2016, with job-market flexibility remaining the most prominent (62 percent of respondents selecting recruitment of quality talent as the highest potential for business growth in 2018, versus 55 percent in 2016) (Fig 5.). The impact of education on recruitment was markedly higher in the public sector, 67 percent, than in financial services, 34 percent. Compared to 2016, however, there is a clear sense that businesses have been making more targeted efforts to raise staff skills and abilities. Fewer businesses overall felt the need to improve on their current efforts, with the biggest falls in emphasis being company sponsorship (down from 52 percent to 45 percent); education (down from 46 percent to 38 percent); and the level of technology/technological advancement in the company (down from 43 percent to 32 percent) (Fig 6.). Having clear progression plans remains the most positively-viewed method of retaining talented staff (mentioned by 59 percent of respondents in 2018), along with training generally (48 percent overall, with particular prominence among financial services, 58 percent) and an improved work/life balance (41 percent overall, with particular prominence in the public sector, 48 percent) (Fig 7.). It is notable though that remuneration, having been mentioned by 42 percent of respondents as a favored recruitment tool in 2016, was mentioned by only 32 percent of respondents in 2018. For technology companies, remuneration was actually the third-lowest retention method mentioned (out of eight), only ahead of share incentives and restrictive covenants. Restrictive covenants themselves were the lowest favored method for all sectors, with just 8 percent of respondents citing them as one of the best retention methods, down from 11 percent in 2016 and 20 percent in 2012. With regard to encouraging an entrepreneurial spirit among talented staff, all methods either remained the same or achieved fewer mentions in 2018 compared to 2016 (Fig 8.). A positive view of this may be that generally in 2018 organizations believe they have already attained a more entrepreneurial culture than those surveyed in 2016, since new technology can foster more entrepreneurial flair. So, the various means through which such a culture could be engendered (leadership, training and incentivization remaining the most popular – with training scoring 72 percent in the public sector) were seen as less important now than they were two years ago. Interestingly, flexible working as a retention tool was mentioned by less than half as many Benelux respondents (13 percent) compared to all respondents (27 percent) and those in Western Europe (32 percent).